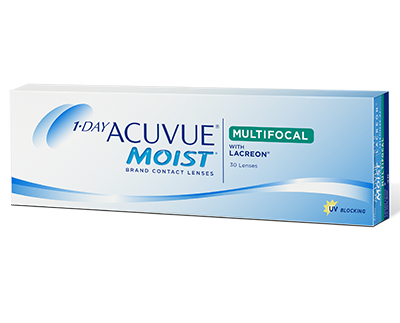 1-DAY ACUVUE Moist Multifocal Contact Lenses have a unique design which will fit in with your own individual ‘mish mash’ of activities and allow you to see clearly for all distances. Whether, that’s a screen at work, doing a jigsaw with the children, watching television on the treadmill at the gym or simply reading the menu for lunch, the unique, pupil optimised design of 1-DAY ACUVUE Moist Multifocal allows you to see near, far and in-between without reading or varifocal glasses. €60 per month (30 pairs) by direct debit. (Alternative quantities available. Minimum purchase 3 months.) Available exclusively in-store.